Earlier this week details emerged about an early version of Rogue One: A Star Wars Story in which Jyn Erso and Cassian Andor would have survived the film. 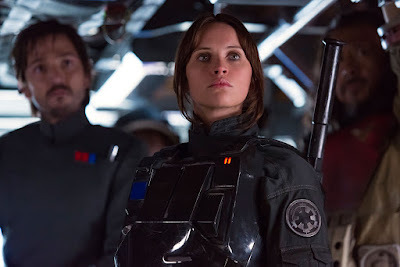 While it was ultimately changed so that all the film's main characters were killed off, John Knoll, the man who came up with original story for Rogue One, recently revealed details about two other alternate endings he came up with for the film. In advance of the film's upcoming home media release (on digital HD this Friday and Blu-ray/DVD on April 4th), Knoll sat down with iO9 where he described the alternate endings. They would have then decided to kill themselves, not knowing if they had succeeded in getting the plans to Leia, fearing they would be captured by the Empire and tortured into revealing Alliance secrets. One interesting aspect of this version of the story is that it makes Leia's story that she is just a member of the Imperial Senate on a diplomatic mission to Alderaan more plausible. With the final version of Rogue One, her statement to Vader is a pretty bold lie considering how close he came to stopping her ship from escaping the battle of Scarif when the plans were stolen. The second ending Knoll described, would have involved a version of the story where Cassian was secretly a double agent--an Imperial spy that had infiltrated the Rebellion. He would have believed at the start of the film that the Death Star was just a bit of Rebel propaganda meant to scare the people of the galaxy into rising up. However, when discovered that the Death Star was real, he would have switched sides and become a true rebel agent. "They’ve got a carbon freeze bomb on the ship and the idea is that he forces everyone into the airlock. “I’m going to set this off and you’re all going to survive.” He sort of times it with one of the hits from Vader’s ship so he blows up the ship and sets off this carbon freeze bomb and everyone is frozen. Then on Vader’s ship they detect no life signs and they think everyone’s dead. And they’re like, “Where’s that ship the plans were transmitted too?” and they go. So I was going to leave our heroes out of the picture. It’s why they don’t show up in Empire or Jedi — they’re stuck in [carbon freeze]." The benefit of that ending is that the heroes could have come back for later stories (perhaps even in the sequel era) and it would have been explained why they weren't in the Original Trilogy. However, this ending would have undercut the drama of the film's climax and cheapened the cost the Rebel Alliance had to pay to get the plans. While the ending we got was tragic, the main characters all really needed to die for the film to weight it needed in the Star Wars story. But that's why the film making process is so long. Ideas have to be tried out to see if they work and when they don't, they can often lead to something great.